In this image from late 2010, software engineers worked in the background as Glenn Research Center technician, Joe Kerka, rotated the SCaN Testbed flight enclosure assembly. The Space Communications and Navigation, or SCaN Testbed will be launched on a Japanese H–IIB Transfer Vehicle and installed on the International Space Station and will provide an on-orbit, adaptable software-defined radio facility with corresponding ground and operational systems. This will permit mission operators to remotely change the functionality of radio communications and offer the flexibility to adapt to new science opportunities and recover from anomalies within the science payload or communication system. The SCaN Testbed, or Space Communications and Navigation Testbed, is set to be tested on the International Space Station later this year. During its five year life in orbit, the SCaN Testbed will provide an experimental laboratory to demonstrate many new capabilities, including new communications, networking and navigation techniques that utilize Software Defined Radio technology. New and improved ways for future space travelers to communicate will be tested on the International Space Station after a launch later this year from Japan. The SCaN Testbed, or Space Communications and Navigation Testbed, was designed and built at NASA’s Glenn Research Center over the last three years. The SCaN Testbed will provide an orbiting laboratory on space station for the development of Software Defined Radio (SDR) technology. These systems will allow researchers to conduct a suite of experiments over the next several years, enabling the advancement of a new generation of space communications. The testbed will be the first space hardware to provide an experimental laboratory to demonstrate many new capabilities, including new communications, networking and navigation techniques that utilize Software Defined Radio technology. The SCaN Testbed includes three such radio devices, each with different capabilities. These devices will be used by researchers to advance this technology over the Testbed’s five year planned life in orbit. “A Software Defined Radio is purposely reconfigured during its lifetime, which makes it unique,” says Diane Cifani Malarik, project manager for the SCaN Testbed. This is made possible by software changes that are sent to the device, allowing scientists to use it for a multitude of functions, some of which might not be known before launch. Traditional radio devices cannot be upgraded after launch. By developing these devices, future space missions will be able to return more scientific information, because new software loads can add new functions or accommodate changing mission needs. New software loads can change the radio’s behavior to allow communication with later missions that may use different signals or data formats. The SCaN Testbed is a complex space laboratory, comprised of three SDRs, each with unique capabilities aimed at advancing different aspects of the technology. Two SDRs were developed under cooperative agreements with General Dynamics and Harris Corp., and the third was developed by NASA’s Jet Propulsion Laboratory (JPL), Pasadena, California. JPL also provided the five-antenna system on the exterior of the testbed, used to communicate with NASA’s orbiting communications relay satellites and NASA ground stations across the United States. NASA’s Goddard Space Flight Center, Greenbelt, Md., developed communications software that resides on the JPL SDR. Glenn led the design, development, integration, test and evaluation effort and provided all the facilities needed to fabricate, assemble and test the SCaN Testbed, including a flight machine shop, large thermal/vacuum chamber, electromagnetic interference testing with reverberant capabilities, a large clean room and multiple antenna ranges, including one inside the clean room. Glenn also will be the hub of mission operations for the SCaN Testbed, with high-speed ties to NASA’s Marshall Space Flight Center, Huntsville, Ala., for real-time command and telemetry interfaces with space station. NASA Johnson Space Center’s White Sands Test Facility, Las Cruces, New Mexico, and Goddard’s Wallops Flight Facility, Wallops Island, Virginia, will provide Space Network and Near Earth Network communications. The SCaN Testbed will launch to space station on Japanese Aerospace Exploration Agency’s H-IIB Transfer Vehicle (HTV-3) and be installed by extravehicular robotics to the ExPRESS Logistics Carrier-3 on the exterior truss of space station. The SCaN Testbed will join other NASA network components to help build capabilities for a new generation of space communications for human exploration. 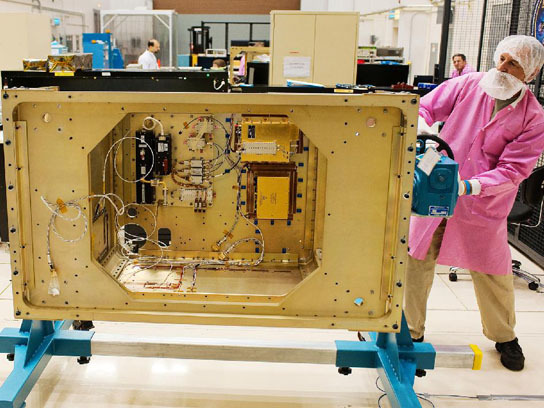 1 Comment on "SCaN Testbed Headed for International Space Station Later this Year"